This entry was posted in entertainment, humour, jokes, pic of the day, quotes of the day! 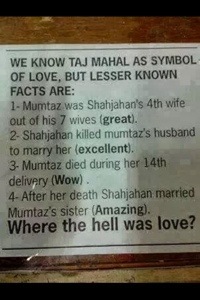 and tagged death, love, prince, taj mahal. Bookmark the permalink. My Heart An Enemy A terrorist! Ah — I think — Love does works as a circulating and passing through agent !!! Kinda hard to read what that’s saying unless it’s from my phone not displaying the image too well. Sorry you couldn’t read it… if you still have problems let me know and I could email the pic to you. Aaaargh ! That’s certainly a downer.